The cuttlefish can be found throughout our waters in most kind of conditions, be it brackish or saltwater. They typically dwell in places near the sea bed with mud or marine clay, deep or shallow waters. They are active in both day and night and prey on small fishes and crustaceans. They can be easily caught on different types of squiding gadgets like from baiting hooks and artificial squid jigs. Sometimes you won't need a hook at all, because the cuttlefish are naturally greedy and often won't let go of their prey even if lifted out of water. They can be eaten or used as baits for fishing. 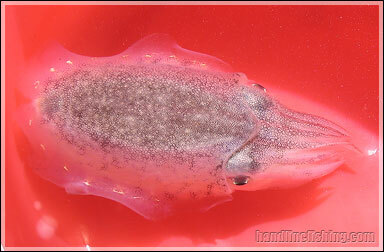 It has a hard internal bone within its body that makes it hard to use the cuttlefish as bait. The head of the cuttlefish alone usually suffice as use for bait. Cuttlefish meat don't fare as well as squids, their flesh is more rubbery and stiff (especially when overcooked). Cuttlefish are often solitary but can sometimes be found in pairs. They often hit on anglers bait intended for fish, which led amateur anglers to believe that a fish is on the line. It is not quite possible to catch cuttlefish or squids using single hook, especially when your using one targetting for a big fish. Commonly encountered sizes in local water ranges from 100g - 400g, while the larger ones are seldom caught (~1-2kg). An angler should first consider what is happening at the end of the line when he sees/feels feedback from the line/rod. It is not always a fish taking a bite; it can just likely be a crab or a squid/cuttlefish especially if you are using a bottom feeder rig. Squid/Cuttlefish have unique way of pulling when they hit your bait. Cuttlefish specificially, have a rather constant rythm of soft jerks in attempt to pull the bait away. At times, they would just hold it there, especially juveniles ones. Once you determine that it is a cuttlefish on the line, you should gently retrieve your line, pausing if it does a jerk. Once it reaches near the surface, you should have a net ready to scoop it from its back. If you cannot reach the cuttlefish for any reason, you should have another line ready with an artificial squid jig. Jerk the bait off cuttlefish as you deploy the squid jig, you may need another person to help you on this. If you have neither have a net nor a jig, you can still try your luck by lifting the cuttlefish directly out of water very gently. There's a good chance that it won't let go, but it only works on small medium sized cuttlefish; bigger cuttlefish be pull back down down by its own weight. When specifically targetting for cuttlefish, baiting squid hooks and squid jigs will work equally well. Both should be deployed very near to the seabed, and move them around in steps if possible. Cuttlefishes are slightly less agile than squids so you want to give them a window/opportunity to strike/catchup. Once the cuttlefish takes the squid hooks/jigs, apply a soft and short jerk to set the hook in. Retrieve with a soft continuous pace. In the event of a failed attempt to lift the cuttlefish out of the water, if the cuttlefish did not squirt any ink upon escape, it is likely strike again immediately or after a short period of time. Simply lower the bait/jig to lure it back. After lifting a cuttlefish/squid straight out of the water, one should take note not to slam/drop the cuttlefish onto the floor. The results can be pretty ugly with ink squirted all over the place, even at you. Gently drop them into a plastic bag or container will suffice.